Fans of pop star Rihanna have expressed concern after she posted a picture of herself cutting up what looked like white powder. In the photo, the singer is seen sitting on her bodyguard's shoulders rolling a cigarette with an unidentified substance. Taken while she was at the Coachella festival in California, the message which accompanies the snap reads: "Memories don't live like people do #coachella". Before it was taken off her Instagram and Twitter pages, fans wrote more than 1,000 comments on the picture, questioning what the substance was. While many have speculated it is marijuana, others fear it could be cocaine. One wrote: "I love her music, not her lifestyle. Hope she gets this under control before we have her funeral on TV like Whitney Houston." A parent of one of her younger followers added: "I have a 10-year-old daughter who loves her and I wouldn't want my child seeing this." Rihanna recently spoke about how the late singer Whitney Houston inspired her to get into the music business. Instagram allows users to alter the colour and lighting of photographs to create an arty look. Rihanna was later photographed with a large rolled-up cigarette while at the festival. Shortly after news organisations picked up the story, the pop star hit back, tweeting : "Pathetic *****". 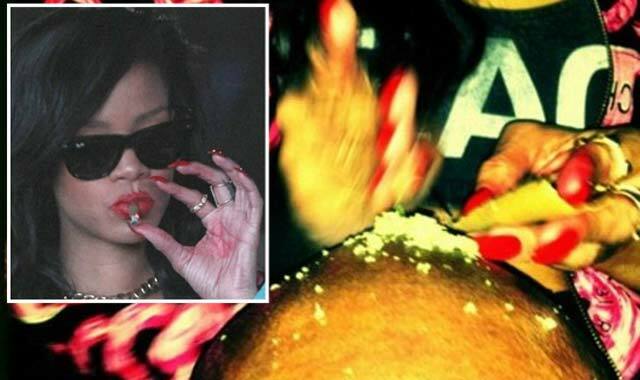 Rihanna is not afraid to stir up controversy and was recently seen smoking what looked like a marijuana joint on holiday in Hawaii. Last October, Rihanna admitted she finds it difficult to be in the public eye and struggles with the expectation that she should be a role model.